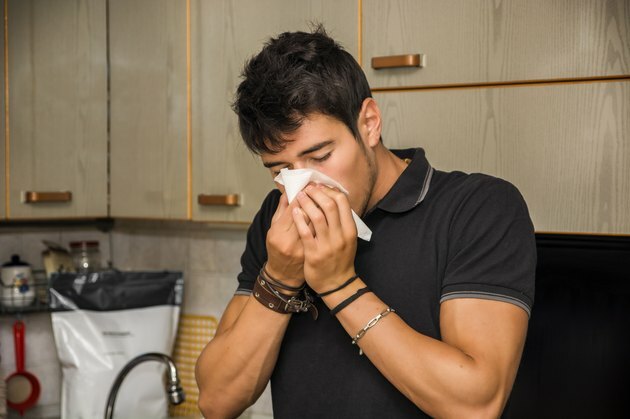 People with sinus problems often experience congestion, irritation, runny nose, frequent cough and facial pressure. The condition can be caused by a wide variety of factors, from seasonal allergies to food sensitivities. In fact, there are a few suggested connections between sinus problems and carbohydrates. Although it's not healthy to eliminate all carbs from your diet, restricting your intake to complex carbohydrates could improve your symptoms. Carbohydrates are not known to cause sinus problems in everyone. In fact, many people eat carbohydrates regularly with no obvious side effects. However, some people have a specific sensitivity to carbs. Similar to a food allergy, this sensitivity causes an abnormal physiologic reaction to occur when carbohydrates are consumed. For some people, this reaction involves sinus congestion or infection. If you believe a carbohydrate sensitivity could be the cause of your sinus problems, consult with your physician for a proper treatment plan and healthy sinus diet. In some cases, sinus problems might be caused by a problem with fungus, according to the Oasis Advanced Wellness website. The mouth and nose are common ports of entry for fungi and other bacteria. Typically, the natural body defenses protect us against the microorganisms and prevent them from harming our health. In some cases, though, our body environment is not conducive for these protective behaviors. According to the website, carbohydrates provide a large amount of sugar for these fungi to feast on. By eliminating carbohydrates, you can eliminate the main food source for the fungi – and hopefully eliminate them altogether. The Centers for Disease Control and Prevention acknowledges that carbohydrates can be classified into two types: simple carbohydrates and complex carbohydrates. Simple carbs are the sugars added to foods during processing. Added sugar are commonly seen on ingredient labels as corn syrup, high fructose corn syrup, dextrose, fructose, fruit juice concentrates, maltose, molasses or syrup. They are commonly added to white bread, crackers, sweets and processed foods. Although these simple carbohydrates can provide you with a quick burst of energy, they provide very little benefit to your health. Complex carbs, on the other hand, provide your body with more nutrition and longer-lasting energy. Complex carbs can be found in fruits, vegetables, whole grain breads, whole grain pasta, oats, beans and brown rice. If you're looking to eliminate your sinus problems, consider just making the switch to complex carbohydrates rather than eliminating all carbs from your diet. According to the Mayo Clinic, a low-carb or no-carb diet can actually be detrimental to the overall health of your body. While it might eliminate some of your sinus problems, it could actually cause more serious health problems. A low carbohydrate diet may cause headache, dizziness, fatigue, muscle weakness, nausea, diarrhea and constipation. If your daily carbohydrate intake is less than 20 grams per day, a condition known as ketosis could develop. This condition occurs when the body does not have enough sugar to produce energy. As a result, it begins destroying your fat stores to create glucose. As fat breaks down, ketones are produced and accumulate in your body. Immediate symptoms of ketosis include nausea, headache, fatigue and foul breath. If left untreated, ketosis can be life-threatening. MayoClinic.com: Low-carb diet: Can it help you lose weight? Can You Live Without Carbohydrates? What Are the 3 Types of Carbohydrates? Which Is Worse: Carbs, Fats or Sugar? Can Sugar Cause Bloating & Painful Gas?